While the V8-equipped Chevrolet Camaro SS is better suited to aftermarket upgrades than the V6 variant, owners of the 3.6-liter Camaro still like to upgrade their cars. If you’re a V6 Camaro owner who falls into that camp, you may be interested in Flowmaster’s new American Thunder exhaust kit for the fifth-generation Camaro (2010-2015) with the 3.6-liter V6 engine. The aftermarket parts company recently put together a video documenting the exhaust system on a fifth-gen Camaro Hot Wheels Edition with the V6 engine. In addition to the exhaust kit, which consists of Mandrel-bent 2.5-inch tubing with 4-inch polished exhaust tips and ‘Super 44’ mufflers, this Camaro Hot Wheels Edition also has Flowmaster’s Delta Force Performance Air Intake installed. The air intake consists of a high-flow 8 layer conical air filter and a molded black plastic high-flow intake tube, which can allegedly provide a 7% gain in horsepower and torque, Flowmaster says. It’s not clear if the exhaust also provides an increase in performance (Flowmaster didn’t provide any numbers) but a small increase is sometimes seen with an exhaust, especially when paired with an aftermarket intake. The fifth-gen Camaro is getting older, meaning used prices are beginning to fall even further and consumers can get them for cheap – especially V6 models. A 2010-2016 Camaro could be a decent bargain for Chevy fans who have always lusted after the coupe, then, and with relatively inexpensive upgrades on the market on like Flowmaster is showing here, it might not be such a bad second-hand buy. 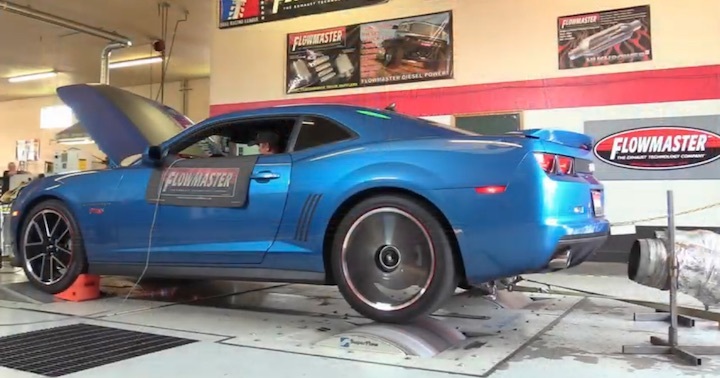 Hear the Flowmaster American Thunder exhaust on the fifth-generation Chevrolet Camaro V6 in the video embedded above. Like this story? Subscribe to GM Authority for more Camaro news. Does flowmaster sponsor all these articles about their exhaust recently? I only ask because there is a ton of aftermarket exhaust options, a lot of which are better than FM, but FM gets all the GMA attention.